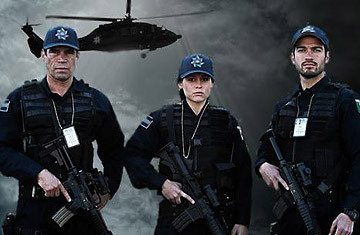 Such is the noble if stilted dialogue in Mexico's new prime-time soap opera, El Equipo (The Team) which portrays courageous federales dodging bullets, buzzing around in helicopters and outwitting evil drug traffickers. Produced by the world's largest Spanish-language broadcaster, Mexico Citybased Televisa, El Equipo has sparked debate, controversy and a little mirth since it hit the small screen this week. Its makers say it's right to paint Mexico's federal police as heroes risking their lives fighting vicious narcos who are armed with rocket-propelled grenades, assault rifles and, most recently, homemade tanks. If the U.S. can glorify its police  think of cop dramas from The F.B.I. to CSI: Crime Scene Investigation  then why, they ask, can't Mexico burnish the image of its officers, who are often depicted as paunchy, gold-chained bribe takers if not as outright moonlighters for drug cartels? But critics argue that Televisa is serving as an unsubtle propaganda machine for President Felipe Calderón, a role it also played in the 20th century for Mexico's dictatorial Institutional Revolutionary Party (PRI) before the PRI was toppled in 2000 by Calderon's conservative National Action Party. With Mexicans taking to the streets en masse lately to protest the country's horrific narco-bloodshed  with more than 35,000 gangland murders since 2007  El Equipo's real purpose, they say, is to restore waning public support for Calderón's military crackdown on cartels. They also question the legality of letting producers film in federal-police installations and use federal helicopters, uniforms and guns to lend a touch of realism. The show showers the usual touches of Mexico's wildly successful soaps, or telenovelas, which are popular from Argentina to Azerbaijan. Sexily dressed women court macho men. The narcos are nacos (uncouth), fat, ugly and badly dressed. Melodramatic moments abound. But it also adds some documentary-style photography and quick cuts to give it a lifelike action feel á la U.S. programs like NYPD Blue. El Equipo producer Pedro Torres says the crew filmed real training and operations and sewed them into the drama. "The story is close to reality," Torres told the Mexican media recently. "What we are, and what we would like to be." To be fair, Mexico's federales, many of whom have been killed in the legitimate line of duty, do have a cleaner, more professional reputation than the country's hopelessly criminal state and local cops. But that's a relative compliment  which is why El Equipo's detractors call it disingenuous if not laughable to present the federal police in such a flattering light. Read "On Location at a Narco-Film Shoot."